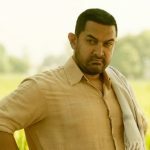 Starcast- Aamir Khan, Fatima Sana Shaikh, Sanya Malhotra, Sakshi Tanwar, Zaira Wasim & Suhani Bhatnagar. Highly awaited Dangal has lived up to the expectations. It grips you thoroughly till the end, each & every sequence makes you feel good from inside. Aamir Khan starrer this sports biopic is incredibly impactful and a positive approach towards women empowerment. At all the aspects, this Nitesh Tiwari’s directorial stands on top and sets a huge benchmark for the upcoming biopics. The story which is based on the real life of former wrestling champion Mahavir Singh Phogat and his two daughters, impresses and inspires a lot. It gives the message, which is actually needed to be conveyed to our society, that ‘Betiyan Beto Se Kam Nahi Hoti’. Superstar Aamir Khan is known for his perfection and once again he has impressed everyone with his brilliant performance. The hard work he has done for the character of Mahavir is highly appreciable. Despite being a superstar, very generously he kept Fatima Sana Shaikh, Sanya Malhotra, Zaira Wasim & Suhani Bhatnagar on the front foot who have played the role of his daughters Geeta Phogat & Babita Kumari (young & adult). In simple words, he has performed like a real father. Doing complete justice to their roles, Fatima & Sanya have given impressive performances. The young Geeta & Babita aka Zaira & Suhani have also acted like mature artists. Undoubtedly, they are the heart of the movie with Aamir as a soul. Renowned television actress Sakshi Tanwar has sincerely played the role of Mahavir’s wife Daya Sobha Kaur. In terms of technicality also, Dangal remained strong. Direction and screenplay of the movie are flawless. Nothing is over or less, all the ingredients are in a correct proportion. Although the run-time is little bit lengthy but that doesn’t create boredom. Powerful music gives more energy to it, especially the title track in the voice of Daler Mehndi. Overall Dangal is must watch movie, which deserves your time. Overall- Very Good (4/5 Stars) +1/2 star for the impact it has left over audience. PS- Salute to the real Maharvir Singh Phogat, Geeta Phogat & Babita Kumari for making India proud. Highly awaited Dangal has lived up to the expectations. It grips you thoroughly till the end, each & every sequence makes you feel good from inside.